A Certain Tide is the next step in the evolution of Joel Pike. The artist’s early endeavors were hazy, ambient-laced piano EPs, but over the years, he slowly added strings and inched his way toward modern composition. As the artist developed his sound, he slightly modified his name as well, and has now dropped his middle name (Nathaniel) from press releases. 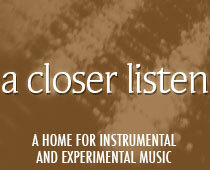 The new album calls on a host of contributors and now includes clarinet and a string quartet. It’s easily the most accomplished of his sets to date. The distance traveled can be seen in the contrast between the majority of the tracks and the few remaining forays into ambience; the latter seems more like a vestigial limb, while the former is the functional body. In an earlier review, we remarked that it’s nice to have friends; we were referring to remix artists, but Pike’s friends are now part of the main mix, and can be seen in the video for “Paean” below. There seems to be a greater confidence in Pike’s compositions, partially due to experience and partially to the live recording of these pieces, which took place over the space of a few days. The positive timbres remain apparent as well, which can be credited to the composer’s outlook and quiet faith. Of the new set he writes, “it speaks of hope in the turbulence.” He’s right; born of belief, this music seeks to operate as an antidote to modern malaise.